North Coast Repertory Theatre's production of Romeo and Juliet. One of Shakespeare’s most popular plays, Romeo and Juliet, is deceptively difficult to stage. One production I saw at Stratford, Ontario, presented a sparkling surface. The most recent Oregon Shakespeare Festival version illuminated the story. The 1968 Zeffirelli film best portrayed the violent context. Baz Luhrmann’s 1996 movie used post-modern wit to focus the star-crossed stars, Claire Danes and Leonardo DiCaprio. In decades past, the lovers’ passionate speeches were often the principal emphasis, and their power can still be felt in scenes acted in the Slings and Arrows TV series, or in the film Shakespeare in Love. The current production at North Coast Repertory Theatre presents an appealing stage set: a timeless Italian street scene angling away in perspective, with a set of marble columns on one side balanced by the famous balcony on the other. The rose hues of the street painting are matched by the warm lighting. (Both scenic and lighting design are by Calder Johnson.) Then the street disappears behind a simple black curtain for the indoor scenes. Scene transitions are unobtrusive, covered by the recorded music of Gabriel Groom’s economical and almost filmic original score. 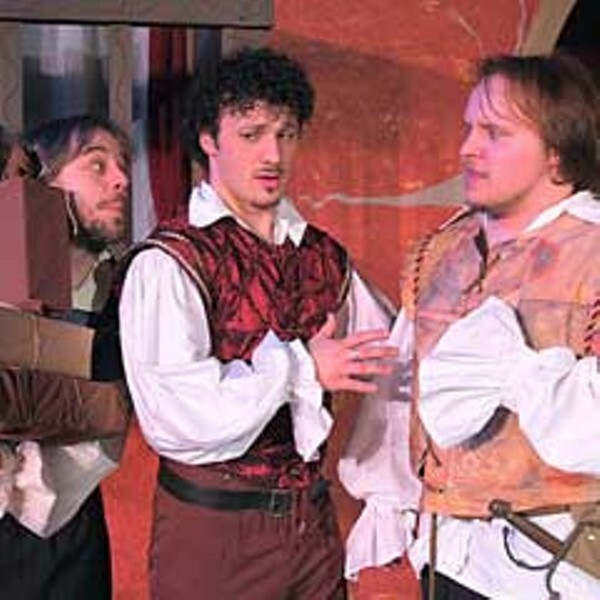 The first act of this production emphasizes action, with Ethan Edmonds establishing a dangerous Tybalt and Victor Howard performing several tour de force scenes as Mercutio. The tinderbox of menace from these feuding families is suggested, though the emphasis on acting out every possible sexual innuendo detracts from the danger. The fight sequences here and later are well designed (by Jasper Anderton) and executed. The second act is more focused on story, as the previously colorful costumes (by Pat Hamilton and Jennifer Trustem) become somber. Juliet’s parents (Ken Klima, Delcie Moon) schedule her wedding to Paris (Neal Schoonmaker), setting in motion the final fatal happenings. Director David Hamilton continues to move the actors energetically, and works with the set design to solve problems inherent in this limited space. As for the words, at best the actors conveyed a meaning with a colloquial ease that matched the fluid physicality of their movements. Lonnie Blankenchip as Friar Laurence and Carol Escobar as the Nurse in particular projected and paced their words well. But there were also plenty of examples from the Mime-and-Mumble School of Shakespearian acting. This is not just a point-keeping quibble. While the momentum of a three-hour play is important, when Juliet and especially Romeo are speaking too fast and too softly to be heard and understood, it has consequences. As the audience sees it, a play is a combination of the script (shaped by textual cuts), the interpretation by director and designers, and the relative strengths of performances. So the Romeo and Juliet I saw was about a monk and a nurse trying to deal with two confused and inarticulate teenagers. The principal focus is on Juliet — especially her emotional scenes, played with full present-tense commitment by Megan Hughes — and her fatal attraction to the cute, dashing but feckless Romeo, played by Michael Roscoe. Though other dramas before and after this one use its mythic story, this is the play that is considered a poetic masterpiece. Why is this a tragedy, as opposed to a soap opera series of unfortunate events? It’s in the language, as it enables the expression of a passion that pushes Romeo and Juliet beyond the bounds of their world. By the standards of local Shakepeare productions, this one is reasonably successful. Missing are some fascinating complications and meaningful themes in the text, but today’s fashion is to concentrate on making the story contemporary, either with modern contrivances, or — as I’m guessing is the intent in this production — by making the teenagers contemporary. That’s a valid and potentially entertaining strategy. The flaw for me was too much of the language swallowed in breathless cell-phone-speak. I suppose for some, however, this could be its appeal. 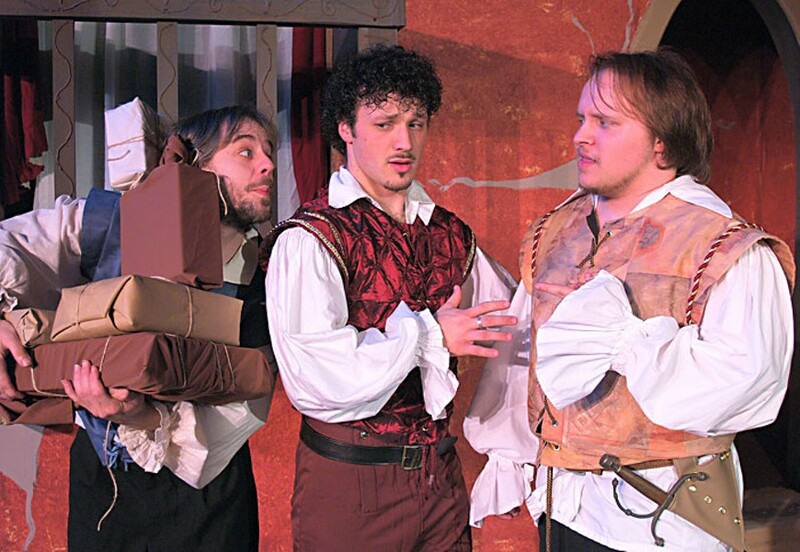 Romeo and Juliet plays at NCRT Thursdays through Saturdays until Feb. 20, with Sunday matinees on Feb. 7 and Feb. 14 — Valentine’s Day. Quick notes: For about a year Jeff DeMark has been experimenting with adding more music to his story-telling evenings. Last Saturday at the Arcata Playhouse, the balance was about half-and-half music-to-talk, with musicians Paul DeMark (brother), Jesse DeMark (son), Damon Brooks, Ross Rowley, Jackie Dandeneau and Jim Silva. It all might be headed toward the North Coast Home Companion, but when the stories and the songs illuminate each other (from radio hits to songs his mother loved), we’re reminded how music adheres to memory, carrying the feeling into the present. Redwood Curtain officially announced that productions begin in April in its new home on First Street in Old Town, Eureka. Quake: A Closet Love Story, a musical by Tyler Olson, has its world premiere at the Arcata Playhouse this weekend (Feb. 5-7). Check listings for times, or the Playhouse at 822-1575. HSU’s The Marriage of Bette and Boo presents two benefit productions in the Van Duzer Theatre on Tuesday (Feb. 9) and Thursday (Feb. 11) at 7:30 p.m., to help send this production to the regional Kennedy Center American College Theatre Festival in Reno.